Another miracle attributed to the saint is the "Uppu Kolam" or salt-water pond, below the ledge where the saint is said to have sat and meditated - the water from this pond is said to have healing properties. A small mosque was constructed under the Hituwangala rock in 1922. The mosque needed no roof as the rock itself is shaped like a cobra hood and is a shelter from the sun and rain. 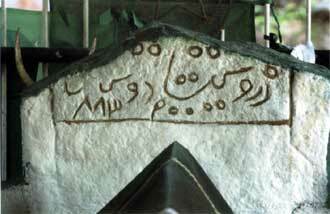 There are several writings in Arabic and the direction of the Kaaba (kibia) is shown in the form of a mihrab cut into the rock. The tombstone, with the words "Darvesh Mohiyadeen Dervesh", and the remains found when excavating to build the mosque, were laid to rest on the southern side of the mosque. The date Hijri 715 is clearly visible on the tombstone. Close to the grave is a stony stairway. This leads up to the meditation room once used by Shawal Hameed Nagoor Meera SaiBo Rali Ullah when he visited Dafther Jailany about 400 years ago. The saint is said to have placed his palm print in sandalwood paste on the rock above the shilla room. 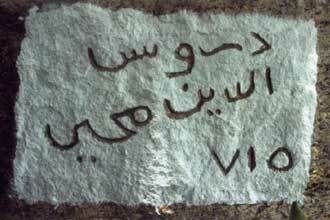 (Also, there are many Arabic inscriptions and writings on the rock). The Saint Nagoor Meera Saibo visited Dafther Jailany accompanied by Saint Seyed Shihabudeen Voliullah. After his visit to Dafther Jailany. 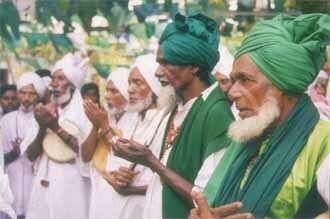 Saint Seyed Shihabudeen had visited Kandy. He had died there and his tomb at the famous Meera Maccam Mosque in Kandy. In the book, Kanzul Karamath, it is mentioned that one day after Isha prayers, Saint Shaul Hameed Meeran Sahib had seen Prophet Hiller (Alaihi salaam) who had requested Saint Shaul Hameed to accompany him to Dafther Jailany in Sri Lanka. It was Allah's wish to show this sanctified abode to Saint Shaul Hameed Meeran Shabhib. The Saint travelled from the Maldive Islands to Galle with his son, Saint Seyed Mohamed Yoosufand several of his murudeens. Meera Majid in Galle town stands testimony to the Saint's visit. It is at Dafther Jailany that the Saint Meera Sahib was awarded the title "Kuthub" (reference Kanzul Karamath, Tamil edition, page 355, and in Mawahihul Majeed Fee Manakibee Shaul Hameed, (Arabic edition).